At this point, I probably wouldn't reboot it. Fashion doll lines aren't going very well, from what I can see at the local toy shops. Their shelf space just keeps shrinking. If anything, I'd be more likely to go back in time and expand on the higher-end dolls from G1, to gear the franchise more towards being a collectable line rather than a play line, with more luxurious packaging, more detailed costuming, better QC, and more carefully selected themes. Collaboration dolls like the Zomby Gaga doll would also probably be a key feature, just to generate revenue with various fan bases. Barbie has done it with great success for decades, and that release in particular had a lot of really nice details in it. I boxed up all of my dolls yesterday to put them out of my head for a bit. I'll possibly put them back on display in my sewing room if I ever get it straightened up, but I was just too over staring at them. I'll keep customising the dolls I have in progress, but there are so many dolls that were just standing on the shelves and it filled me with anxious dread. I've been bitten by the bug because of my foray back into customising. I've bought a Sig Robecca (without stock), New Scaremester Gigi, Sirena, and Dragon CAM for my collection. The Dragon is missing her wings, but I'm thinking of making custom ones for her, adding horns to her model, and rooting her with a new do. 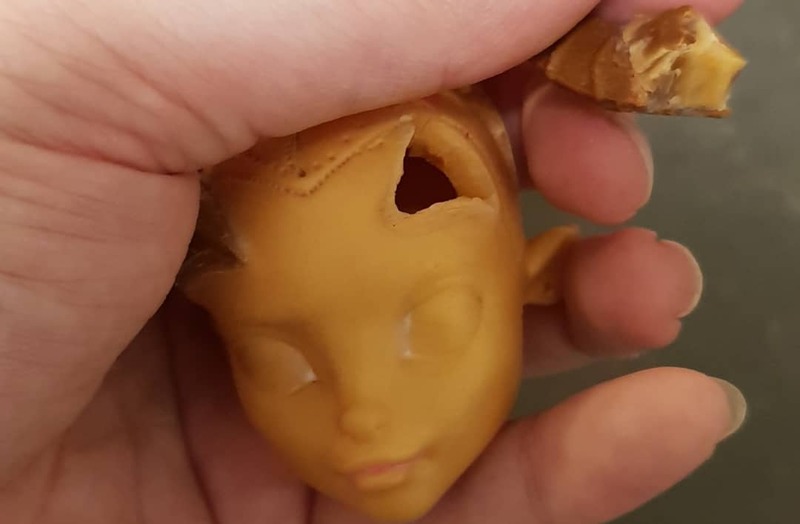 Sirena will be rerooted and gothified (or swapped for my existing Sirena, for the same treatment, depending on faceup and hair). Robecca and Gigi will stay as-is, but I have to hunt down stock for Robecca now. Customs / Gilda Goldstag Mod -- Kind of got there??? So I'm finally getting back to customising after two years of not working on a single MH doll, and I decided to get around to tackling my Gilda. I got around her horrible glue head by freezing and then melting the glue inside with hot water (freezing popped the glue off the vinyl inside, heating it up made it easy to remove; bless you, high school chemistry). Unfortunately, that was the easy part. It's not super clear because I had poor lighting, but her left (our right) horn is not properly seated in its little notchy groove. There's a pretty big gap in person and it bugs me so much that I've bought two other Gildas over time, seeking that Perfect Pair of horns (I did get there eventually). 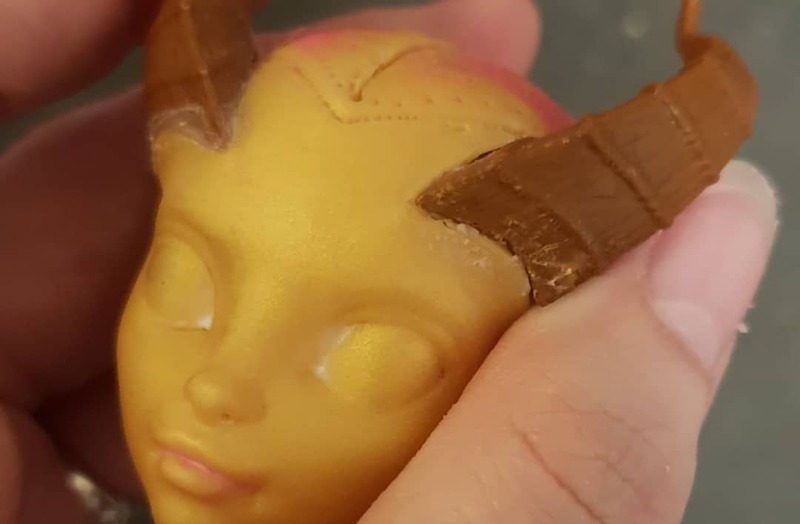 I'm letting her head soak in soapy water over night in the hopes that it might soften the glue somewhat, then I'm going to try attacking it with more soapy water and acetone. I kinda got there. Sort of. A bit. I basically sliced her head open, then cut in and back at an angle to cut the horn out. I've shaved it down and tomorrow I'll clean her face-up off the rest of the way tomorrow, patch her with some Liquid Fusion, and try to put the horn back in place once it's dry. After that, REINFORCE THE DAYLIGHTS OUT OF IT SO IT WILL NOT BUDGE EVER AGAIN. I do not recommend this method, but it looks like crooked horns can't be fixed any other way. I tried dissolving the glue with acetone, wearing it down with hot water, soap, and a diamond file, and even scraping away at the hard glue with a awl. In the end, the glue underneath is too firmly attached to do anything but cut the horn out as close to the edge of the glue as you can get. Brags / Re: What did you get for Christmas? No dolls this year for me. My partner gave me the Eevee Let's Go! Pokemon Switch, and his friend gave me a copy of Octopath Traveler. I was so surprised and blown away. I'd never think to buy a game console for myself these days, especially one that wouldn't be of much interest to him, since we share them in this house. It turns out, he was really interested in a few of the games I'd mentioned, and especially amused by my laughing at Yuki Aoi voicing Eevee. It was a really great gift. 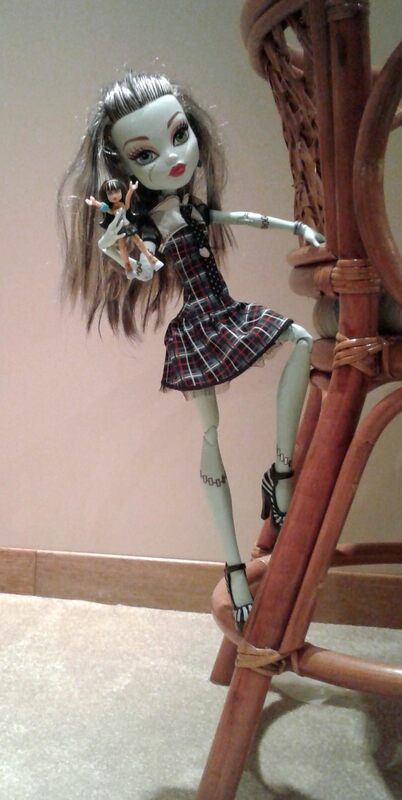 Clawdeen's Closet / Re: Sewing machine eating fabric, help? You probably also need to swap your needle. Stretch fabrics require a ball needle instead of a point. The points of a regular needle can snag on the knits instead of cutting through, which pushes them into your feed dog. A ball needle will slide into the gaps in the stretch/knit material, instead. Is anyone else planning to turn to Tumblr now that the Flickr situation is turning sour? I'm trying to decide how to post photos in future, since Photobucket likewise kicked the pooch recently with their Pro vs. Free move. Is Imgur the last bastion of image sharing? Received some Sylvanian Family furniture in my recent AmiAmi order and put the Garden Tea Set straight to use! I don't know that much about her, just that it was or is a Japanime series. Cutie Honey is a classic! She's had quite a few incarnations over the years since she was created. Her theme song is also catchy as anything. I've been heavily into the Takara Jenny dolls, and recently found a nice lot on Buyee (Japanese purchasing service) with some Jenny dolls as well as a rare dark skinned Jenny with what resembles dreadlocks, and a Cutie Honey doll. Just ordered a new mouse for my computer. The grips on the side of my old one have started peeling off pretty badly, and the left click is out of whack, such that it double-clicks all the time and opens links twice. I've cleaned everything thoroughly, but it's still buggy. So. 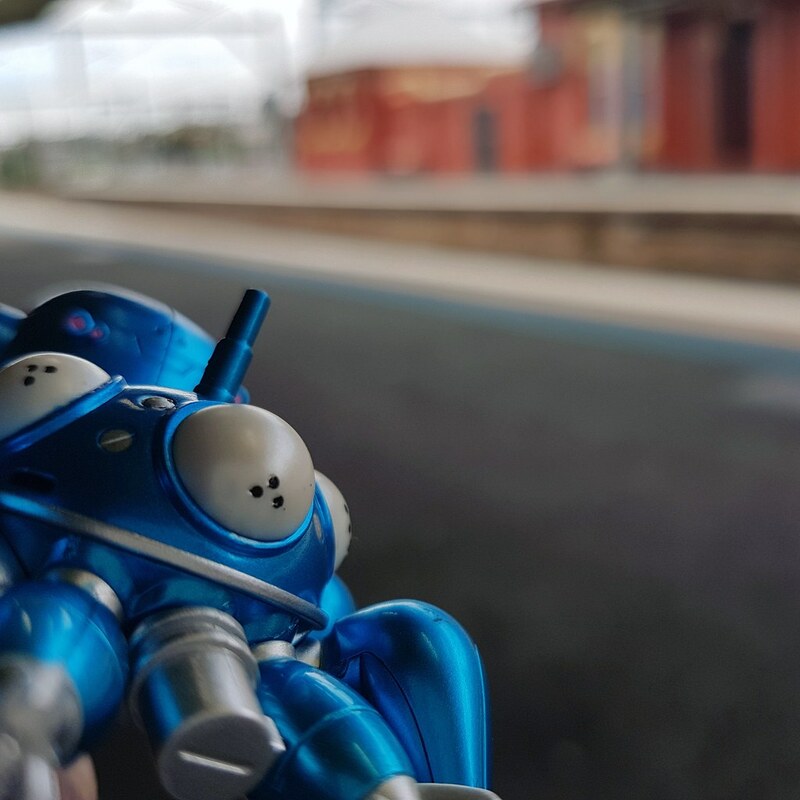 I took Tachikoma to the city with me yesterday and made a little travelogue! More photos of his adventures are on Flickr and my Instagram. I am a spoilt woman, and when he told me he wanted me to order the doll, I was just crushed by sentiment. Lhia, congrats on getting your MiniFee after all! And on having such a thoughtful and caring partner, makes it all the sweeter. Is this going to become your FAVORITE doll now?! He's been chatting with me about what I plan to do with her/how long it'll take for them to make her/how frequently events come around at Fairyland and so on. Today's thrift store find: Frightfully Tall Frankie Stein, seen here recreating her favourite scene from King Kong.